This week is the week! Fall officially begins on Wednesday! Which means…we’re going to be talking a lot about fall wedding cakes. Today seems like a good day to start that conversation. And this simple yet elegant wedding cake is the perfect cake to officially kick off fall a few days early! Using succulents rather than fresh flowers to adorn wedding cakes seems to be rather popular. It’s a trend I can get behind. 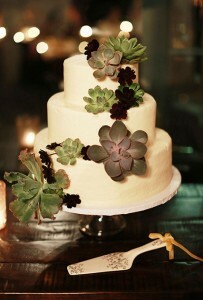 I love the simple, understated elegance of this cake. It’s visually stunning without being stuffy or boring. The succulents give it the perfect floral touch without adding too much.